Dance Congress 2018 kicked off Saturday morning with a fantastic catered breakfast from the Old German Bakery. It was nice to sit down and enjoy the company of fellow students and friends over a breakfast sandwich or pastry. It was just the thing to get our dance energy going for the amazing lineup of guest dance pros we enjoyed. 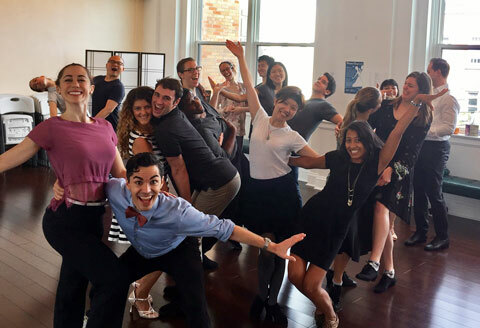 Our first workshop was the Lindy Hop with Samantha and Brian Lawton, nationally acclaimed dancers, choreographers and Swing specialists. They not only kept our feet busy with their quick steps but also kept us laughing with their unique and witty teaching style. Our second workshop of the morning featured Boriana Deltcheva, 3-Time Bulgarian Latin Champion and 3-Time US Latin Silver Medalist. 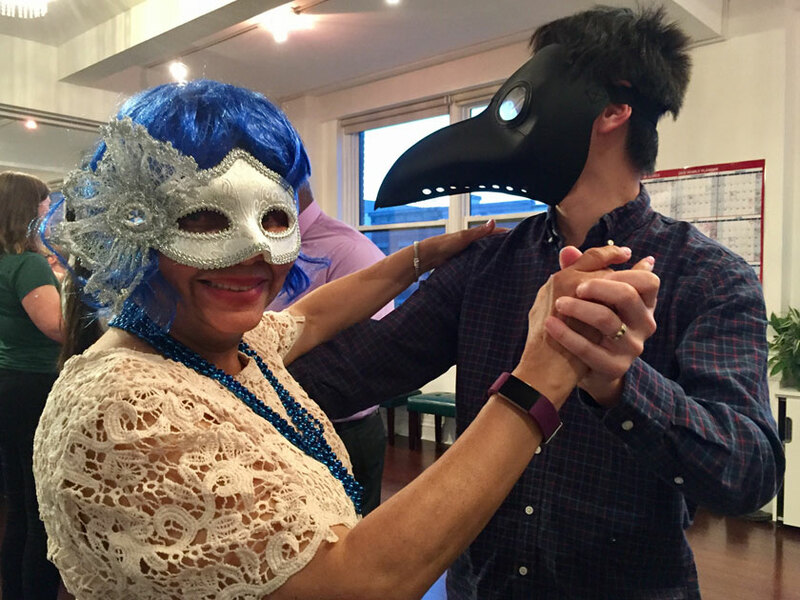 She used a slow Rumba and multiple versions of a familiar song to inspire us to think about the musicality of the songs we choose for our dances. One version was slow with focus on the vocals and was paired against a remixed version that incorporated more percussion. The added drums gave the song a new flavor and depth which in turn added a more rhythmical element to our dance moves. We then contrasted that with the more lyrical original version and explored different ways to add musicality through stylistic interpretation. The last workshop for the morning was taught by Lori Ann Greenhouse and Kelvin Roche, 9 Time World Hustle Champions. 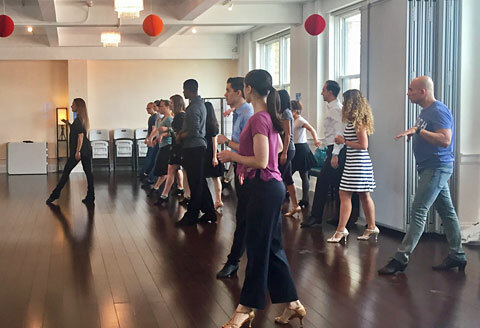 Kelvin used warm-up exercises to encourage us to be very conscious of our movement through space and keeping our bodies centered as we move through our dance steps. We were then moved into the world of Hustle, floating across the floor with quick, light steps that are just too much fun. Lunch was a fantastic spread by Taqueria with live music by Matty D and social dancing before moving to the long anticipated heats and showcases. We were happy to be joined by Derek and Lulu from SHDA in Philadelphia for the Dance Congress. In the heats, they dazzled us with one round after another with seeming unending energy. All the couples who participated in the heats were a pleasure to watch with their unique costumes and variety of choreography. For some of our students, such as Vlera, Endri and Hannah, it was their first time on the floor with an audience! For other students, such as Elizabeth and Wilma, their years of experience in dancing gave their dancing an extra dimension. Both Pro-Am and Am-Am showcases were great fun with a wide variety of themes and musical choices. Some fast and energetic, some slow and graceful, all representing countless hours of planning and practicing to create a lineup that was quite impressive. Both the heats and showcases were judge by Boriana, and for the showcases, each performer received a special feedback on their particular strengths and areas to improve. Thank you to all our guests who showed up to support their friends and family. Thank you to our special dance pros who each taught us something we will carry with us and add into our lives of dance. Thank you to all the volunteers that helped throughout the day to keep things moving smoothly. We appreciate every table you set up and chair you moved. 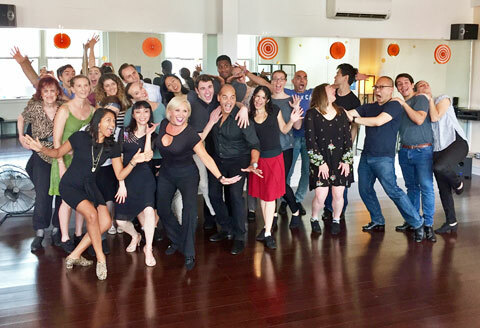 Thank you to all the dancers who participated to make the day what it was…for you and all about you. It was a celebration of all that you worked hard to accomplish over the last year. All the sweat and frustration, fun and laughter. Congratulations to each of you for all that you have accomplished and all the best for what exciting things this year to come will bring. Looking forward to Dance Congress 2019! 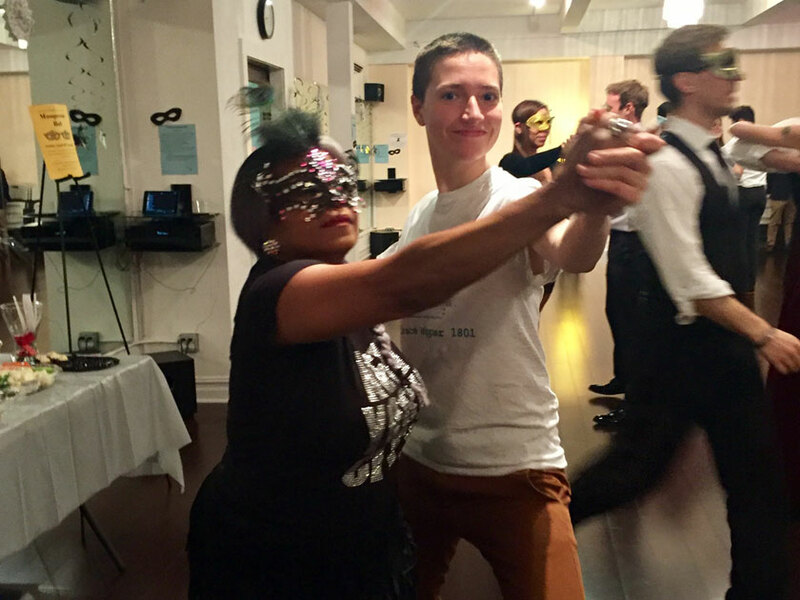 Jersey City Ballroom’s first official Dancing & Wine event was deliciously fun. Everyone’s hip movements seemed to be enforced by glasses of rosé. 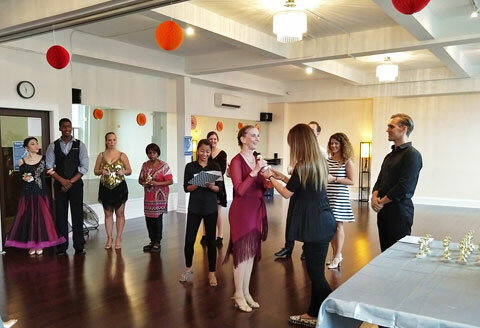 The workshop was taught together by Shimkiri and Werner and the added benefit of having two instructors paid off as everyone successfully learned an open American Rumba choreography. 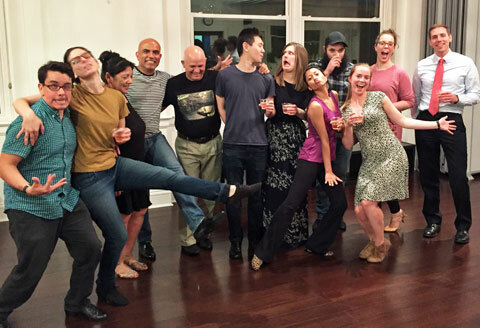 It was a blast and we hope to be holding more Dancing & Wine events very soon! Our Spring Spectacular 2018 was a great hit. With more than 22 numbers, we kept the audience entertained and wanting more! 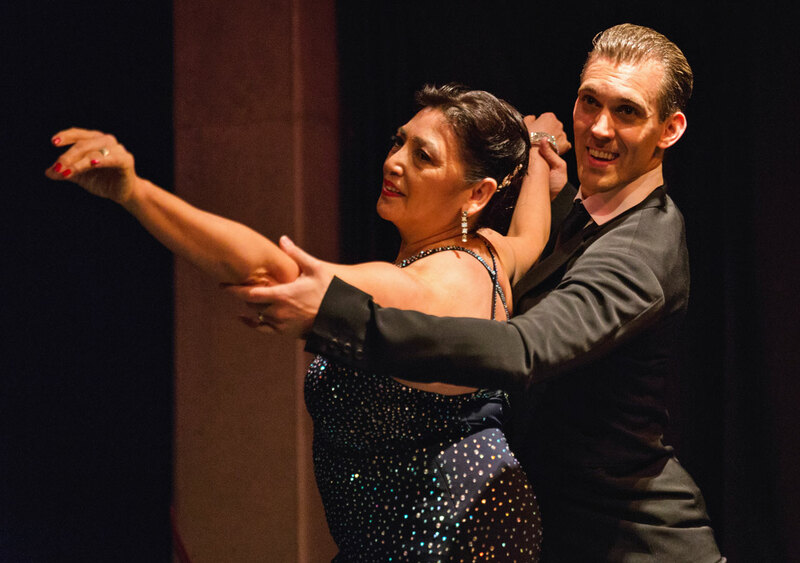 Performances included Latin numbers such as a Pro-Am Cha Cha Cha by Anna and instructor Werner Figar, to traditional Ballroom numbers such as Slow Waltz by the Am-Am Performance Team. 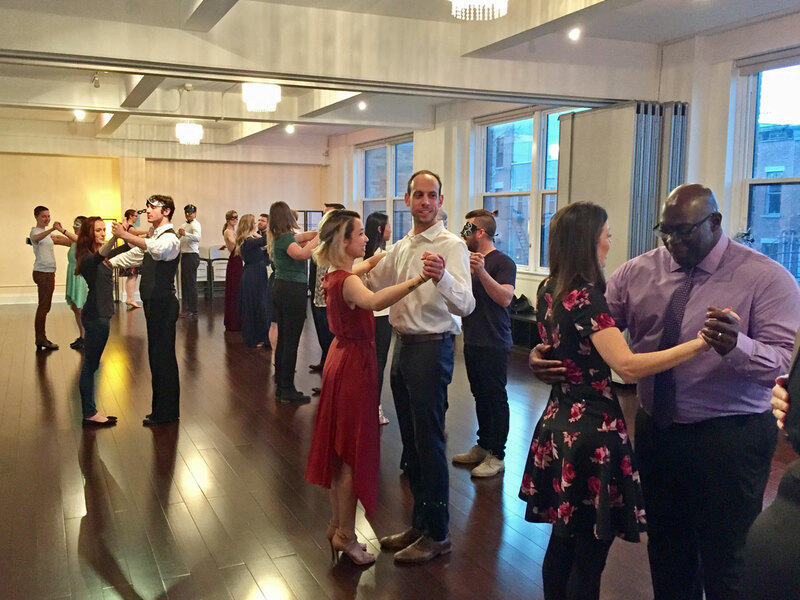 Instructors Emily and Dylan performed a Viennese Waltz, Resident Coach Joel showcased Salsa, and Co-Founders Shimkiri and Werner ended the evening with a romantic Rumba. Congratulations to all of our students who danced their hearts out. Every number was unique and it was exciting to see all the improvement and development that our students are undergoing. Job well done everyone! Congratulations to all of our performers and a special thank you to all who attended. 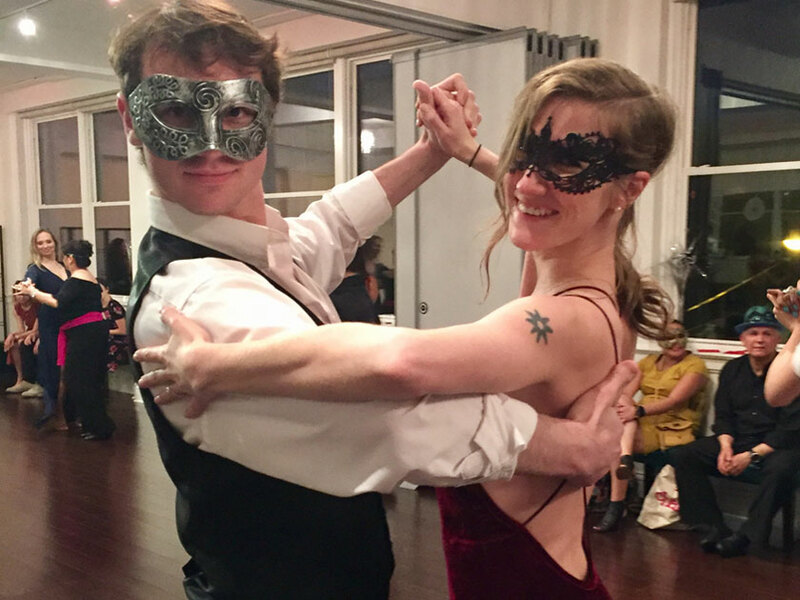 Thank you to all who made out to our first ever Masquerade Ball dance party. It was such a fun event and it was amazing to see all of the creative masks and disguises that everyone wore. One attendee even hand-made her mask! Of course, as the night went on, some of the masks came off to improve visibility (and airflow!) for dancing. 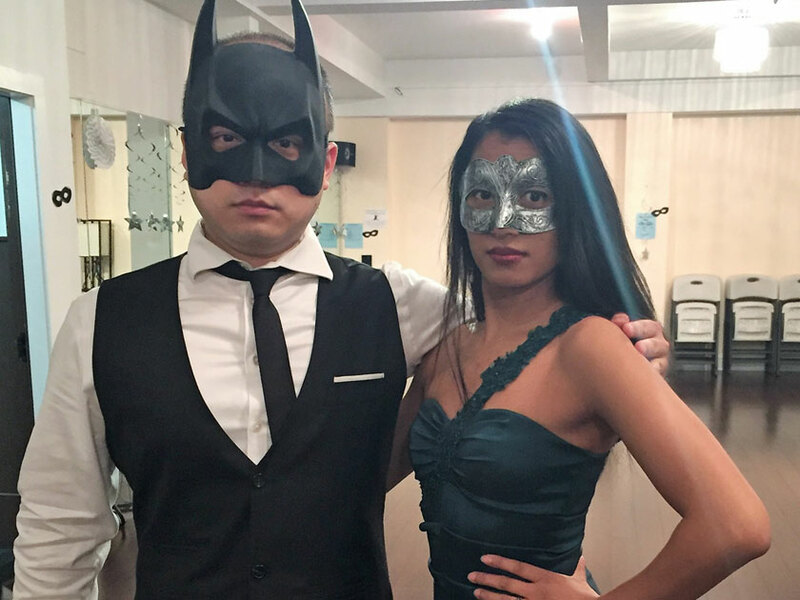 See More Photos from our Mascarade Ball on our Gallery Page.